The Bosworth Company is proud to install home backup generators by Kohler. There is nothing like the security of knowing your home’s electrical system is automatically protected. Kohler’s commitment to “the comfort, health and well-being of people” has made the company a global force in the manufacture and marketing of a vast array of effective, affordable power solutions. Today, Kohler is on the leading edge of total solutions for residential, commercial and industrial power. Their commitment to innovative products and world-class engineering, and unmatched value is stronger than ever and they continue to be a benchmark by which all others compare. A home generator is installed outside of your home and keeps your power on during an outage. It comes on automatically within seconds of a power outage. So whether you’re home or away, you can count on Kohler generators to back up your home’s electrical system. Their automatic operation guarantees backup power directly to your home. Kohler generators power your entire home, including critical hard-wired systems like AC, heat, sump pumps, well pumps, security systems and large appliances. Kohler generators run on existing natural gas or LP fuel supply, so they don’t need gas cans or extension cords. No matter what, your Kohler generator is fueled and ready to deliver power to your electrical panel. From the refrigerator to your HVAC, Kohler will protect all of your home’s electrical systems. 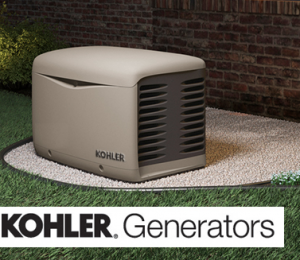 Need more information on Kohler or home backup generators themselves? We’d be happy to answer any questions you may have. Contact our team today!